NFYA antibody LS-C18769 is an unconjugated rabbit polyclonal antibody to NFYA. Validated for ELISA and WB. NF-Y (A subunit) peptide corresponding to a region near the N-terminus of the human protein conjugated to Keyhole Limpet Hemocyanin (KLH). Suitable for immunoprecipitation, immunoblotting, ELISA and supershift assays. This product was assayed by immunoblot and found to be reactive against the differentially spliced 35 and 42 kD forms of the A subunit of human and mouse NF-Y at a dilution of 1:1000 followed by reaction with Peroxidase conjugated Affinity Purified anti-Rabbit IgG [H&L] (Goat) catalog no. LS-C60884. No reaction was observed by immunoblot against the 25 kD B subunit of NF-Y. This product was also tested in a gel supershift assay and found to be reactive against human and mouse NF-Y using 2.0 ul per assay. This product was assayed against NF-Y A subunit peptide in an antibody capture ELISA using (#LS-C60884) Peroxidase conjugated Affinity Purified anti-Rabbit IgG [H&L] (Goat) and ABTS). A dilution of 1:10000 is suggested from this experiment. No reactivity was observed by ELISA against the B subunit of NF-Y. 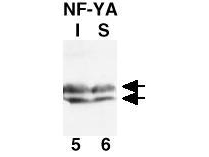 Anti-NF-Y(A subunit) Antibody - Western Blot. CHO-7 cells were cultured in the absence (I) or presence (S) of cholesterol. Equivalent aliquots of chromatin from each sample containing ~50 ug of total protein were subjected to analysis by SDS-PAGE and western blot. After transfer, the membrane was probed using anti-NF-YA as the primary antibody at a 1:1000 dilution, followed by reaction with HRP conjugated Goat-anti-Rabbit IgG [H&L]. Signal was developed using an ECL kit followed by autoradiography using a 30 exposure. The antibody recognizes NF-YA as a doublet of ~42 kD in size.